Nononoxynol-9, (C33H60O10, chemical structure at right) is used in a mixture with other Nonoxynol-n (Nonylphenol polyethoxilates oligomer) as a common spermicide component of condom lubricants. Condom use has been documented in sexual assault as a means by which criminals can avoid leaving behind incriminating DNA evidence. However, in the absence of DNA evidence, detection of the various components of condom lubricants can serve as a causal link between a victim and suspect. In this context, the detection of specific lubricant components such as the spermicide Nonoxynol-9 can serve as a probative link that provides an avenue to corroborate other evidence or information related to the crime. However, the detection of Nonoxynol-9 for evidentiary purposes has not been fully exploited because its physical characteristics are generally incompatible with standard GC-MS instrumentation. Recently, Shepard and co-workers (R. A. Musah, A. L. Vuong, C. Henck and J. R. E. Shepard, J. Am. Soc. Mass. Spectrom. 23, 996-999 (2012), and Pittcon 2012 poster abstract) evaluated the use of standard GC-MS for Nonoxynol-9 analysis and Prof. Shepard from the university of Albany (NY USA) kindly provided us with information on the challenge of Nonoxynol-9 analysis, and with a preprint of his paper which serves for comparison with our results. Another reference for standard GC-MS analysis of Nonoxynols (Nonylphenol polyethoxilates) is Z. Y. Wu, C. P. G. Ruhle and P. J. Marriott, J. Chromatogr. A. 1218, 4002-4008 (2011). Keep reading for the "small miracle" that Cold EI brings into the analysis of Nonoxynol-9. 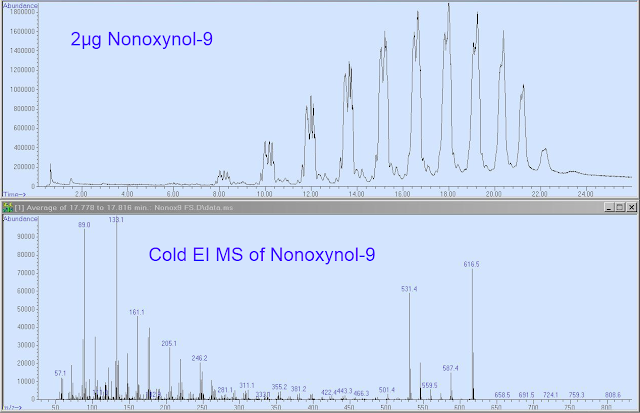 In Figure 1 below we demonstrate the analysis of Nonoxynol-9 and as immediately observed this analysis is highly successful with the 5975-SMB GC-MS with cold EI. All the Nonoxynol oligomer mixture compounds eluted, from Nonoxynol-3 up to Nonoxynol-14, while Nonoxynol-9 is the most abundant group of isomer peaks. The Cold EI mass spectrum of Nonoxynol-9 exhibits an abundant molecular ion (>70% relative abundance) and is very informative with additional five characteristic high mass fragments. The demonstrated TIC sensitivity is also good and practically without visible baseline noise. In contrast, as shown in Figure 2, the limit of detection with standard EI is about 2 µg Nonoxynol-9 mixture and for that sample no molecular ion is observed in standard EI already for Nonoxynol-5. As shown, for the same injected amount of 2 µg mixture, the TIC S/N is only about one for the Nonoxynol-9 with standard EI analysis. Thus, it is immediately visible that the 5975-SMB GC-MS with Cold EI is few orders of magnitude more sensitive, far more informative and even three times faster in the analysis of these heavy and semi-polar Nonoxynol-9 compounds. The full list of experimental conditions used to obtain Figure 1 below and the data described in this post is given below. The key experimental parameters that helped in the achievement of the effective Cold EI analysis of Nonoxynol 9 are: a) the use of short column with high column flow rate; b) the use of contact-free fly-through Cold EI ion source that has no ion source peak tailing even for the lowest volatility and most polar compounds; and c) the vibrational cooling of large compounds in the supersonic expansion that resulted in the supersonic molecular beam which induced significant enhancement in the molecular ions, and the larger the compound the greater is the degree of enhancement as discussed in another post in this Blog. Figure 1. 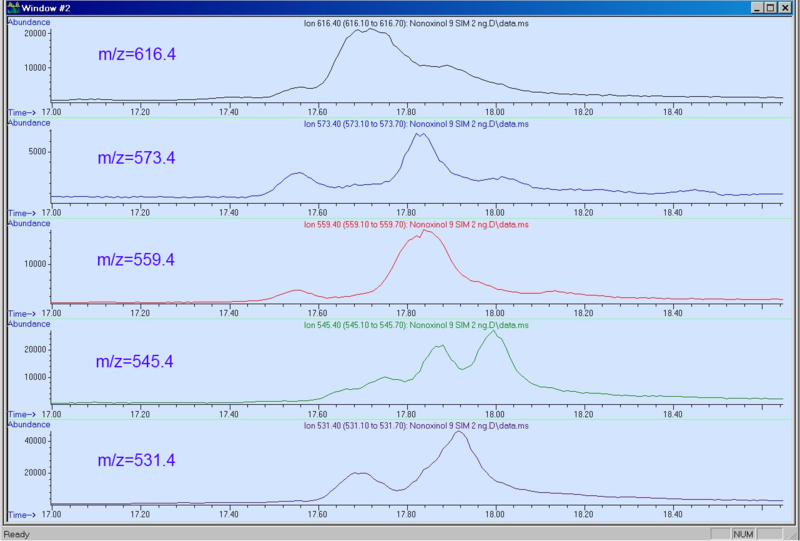 Mass chromatogram (TIC upper trace) of Nonoxynol-9, and a representative Cold EI mass spectrum of one of the Nonoxynol-9 isomers. Note the abundant molecular ion and rich and informative mass spectrum of this heavy compound. Click on the Image to zoom. Figure 2. Nonoxynol-9 analysis by standard GC-MS (Agilent 6890 GC + 5972 MSD) taken from the supplementary material of the paper by R. A. Musah, A. L. Vuong, C. Henck and J. R. E. Shepard, J. Am. Soc. Mass. Spectrom. 23, 996-999 (2012). As shown, the limit of detection with standard EI is about 2 µg Nonoxynol-9 mixture and for that sample no molecular ion is observed in standard EI already for Nonoxynol-5. Click on the Image to zoom. Sample: Technical Nonoxynol-9 sample that was diluted to 1% and also to 10 ppm in methanol. The sample was originally purchased from Spectrum Chemicals. He column flow rate: 5 ml/min with flow program after 20 minutes to 16 ml/min. On column amount: 2 µg of the total Nonoxynol-9 mixture in full scan mode and 2 ng total mixture in the SIM mode of analysis. GC Oven: 120ºC followed by 10ºC/min to 330C and wait 5 min for total of 26 min. Cold EI source: 12 mA emission, 700 mBar nozzle backing pressure, 60 ml/min total He flow rate (column plus make up at 250C transfer line temperature). MS parameters: Mass spectral scan range was 50-900 amu, scan speed ~2 Hz and SIM Dwell times were 100 ms. 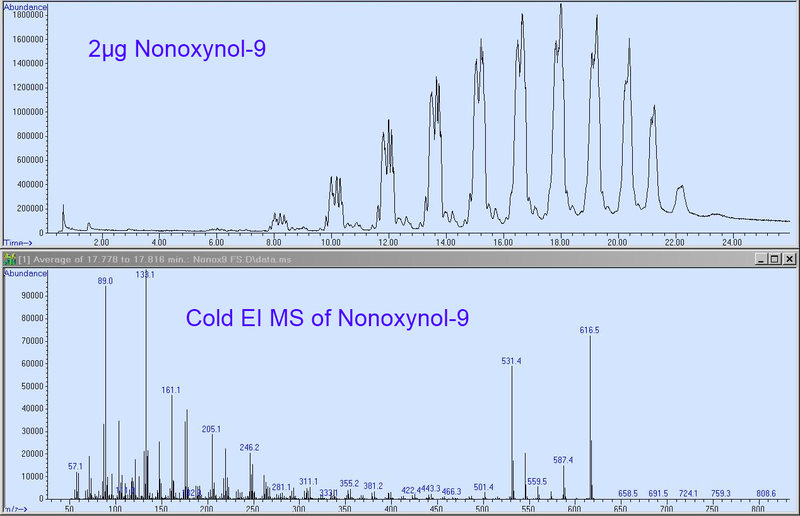 The main goal of effectively analyzing Nonoxynol-9 in its Nonoxynol-n mixture by the Aviv Analytical 5975-SMB GC-MS with Cold EI was easily achieved as demonstrated in Figure 1. Abundant molecular ions were observed for all the Nonoxynol-9 isomers as well as for all the other Nonoxynol-n (N=3-14) mixture compounds, which is in marked contrast with standard EI results in which already for N>5 no molecular ions are observed. Reasonable chromatographic separation of the various Nonoxynol-9 isomers was achieved, without peak tailing, as demonstrated in Figure 3 below, despite the use of short column. In contrast, with standard GC-MS ion source peak tailing (and poor sensitivity) completely eroded the isomer separation for Nonoxynol-9. The Cold EI mass spectra of Nonoxynol compounds were characterized by having abundant molecular ions plus five other characteristic high mass fragments with relative abundances which were highly isomer specific (Figures 1 and 3). 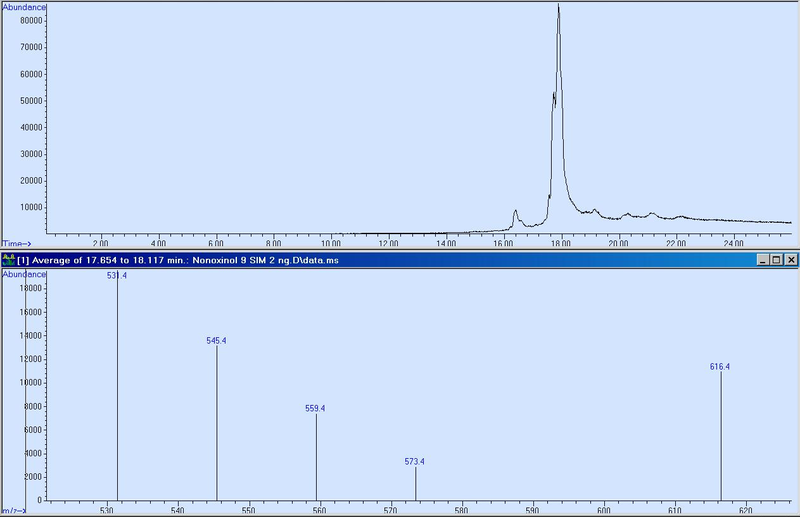 All other nonylphenol polyethoxilate compounds (Nonoxynol-n) were detected, from Nonoxynol-3 up to Nonoxynol-14, while Nonoxynol-9 was the most abundant peak in the TIC mass chromatogram. Note that the molecular ion of Nonoxynol-14 m/z=836.7 was easily observed. In contrast, standard GC-MS analysis of the same Nonoxynol mixture ended with Nonoxynol-9 being the last to elute compound. Thus, the 5975-SMB proved again its feature of having uniform response to all the mixture compounds. The use of short column (5 m) and high column flow rate (5 ml/min) enabled the elution of these large, semi-polar compounds with molecular weight of up to m/z=836, which are incompatible for analysis by standard GC-MS, while the use of fly-through ion source eliminated ion source peak tailing and resulted in having uniform compound independent response, in marked contrast to standard EI. Isotope abundance analysis with the Tal-Aviv Molecule Identifier (TAMI) software helped in the unambiguous identification of Nonoxynol-9 and its correct elemental formula C33H60O10 was listed as number one in the TAMI software hit list, as shown in Figure 4 below. This identification is in addition to the possibility to add Nonoxynol-9 Cold EI mass spectrum to the NIST library for library based identification. For further information on the powerful TAMI software please visit its website and/or contact us for its manual and demonstration on your files. The analysis took 26 min which is reasonable and over three times faster than with standard GC-MS analysis of these heavy compounds (Figures 1 and 2). 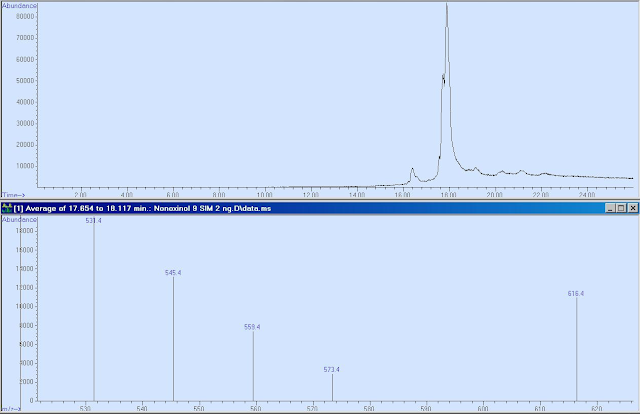 Excellent full scan TIC sensitivity was obtained with TIC S/N>500 (peak to peak) for 2 µg Nonoxynol-9 mixture. Thus, we demonstrated over 500 lower TIC LOD with the 5975-SMB GC-MS with Cold EI for this compound than what was obtained with standard GC-MS, which is important for forensic applications. This superior TIC sensitivity combined with an estimated over 1000 times more abundant molecular ion (>70% vs undetected)) implies that the S/N gain on the molecular ion could approach the staggering value of 1,000,000. Excellent five ions SIM sensitivity was demonstrated with S/N of >2000 (peak to peak noise) for 2 ng Nonoxynol-9 mixture while using its molecular ion m/z=616.4 which should be very selective. In Figure 5 below this SIM analysis is shown. Thus, 1 pg extrapolated Nonoxynol-9 mixture LOD Milestone was achieved. Figure 3. 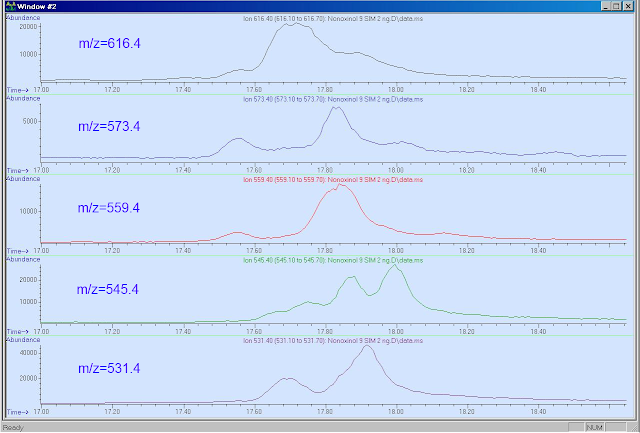 SIM mass chromatograms of the five indicated ions around the elution times of Nonoxynol-9 isomers (2 ng on-column amount). Different traces for the molecular ion and for each fragment mass are clearly observed and over seven distinct isomers can be extracted with different Cold EI mass spectra. We believe that these traces could provide valuable forensic information for the characterization of the source of the Nonoxynol-9 spermicide, hence could point towards a specific source, namely a specific condom brand, while ruling out other condom brands. Click on the Image to zoom. Figure 4. 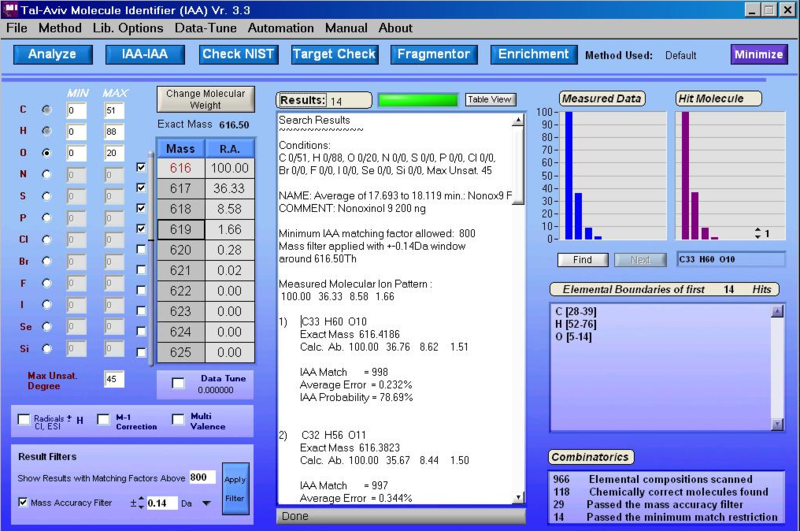 Isotope Abundance Analysis with the Tal-Aviv Molecule Identifier (TAMI) software of the averaged Cold EI mass spectrum of the Nonoxynol-9 group of isomers. As shown, the correct C33H60O10 elemental formula is given by the software as number 1 hit in its list with a high matching factor of 998 (out of 1000). Thus, the identity of Nonoxynol-9 is further confirmed. This software serves as our effective alternative to accurate mass TOF mass analyzers. We note that the Cold EI mass spectrum of Nonoxynol-9 can be added to the NIST library (of several isomers separately and/or averaged over all isomers) and as a result Nonoxynol-9 can be unambiguously identified by the NIST library, which is a legally acceptable form of identification. We believe that no other method of identification can provide such rich and informative mass spectra. Click on the Image to zoom. Figure 5. Five ions SIM analysis of Nonoxynol-9 mixture. 10 ppm sample mixture was injected with split 5 (2 ng on-column amount) and the obtained signal to noise ratio in peak to peak on the molecular ion is over 2000. Thus, in contrast to other methods the 5975-SMB GC-MS with Cold EI has the potential of being able to analyze ppb levels of Nonoxynol-9 in complex matrices as desirable for forensic applications. Click on the Image to zoom. We hope that you find this challenging analysis of Nonoxynol-9 as an interesting example of Advanced GC-MS.